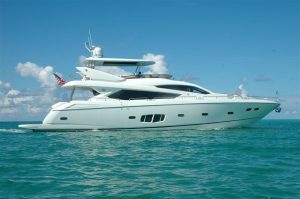 Check out this beautiful used 80' Sunseeker yacht for sale in Florida! : Atlantic Yacht & Ship, Inc.
Word just came in from Stephen Faraldo that he has listed a great deal on an used 80′ Sunseeker yacht for sale in Florida! The 80′ Sunseeker yacht series shares the same characteristics of her bigger siblings. This includes higher bulwarks and zero-speed fin stabilizers. Yet the yacht is still at a point where owner operations is a practical reality. At the, the 80′ Sunseeker perfectly demonstrates the Sunseeker pedigree. An example of which is soft riding through waves and agile turning ability with swift, precise return. Furthermore, this yacht has good performance in following seas; so often a weak spot of other manufacturers. Moreover, this yacht has every option you could desire. She has a US Flag and is duty paid for seamless US cruising. Overall she has upgraded galley refrigeration, a hard top, electric sun roof, teak flybridge, and electric crew door. Likewise, she has FLIR navigation, GHOST security system, hot tub, and teak fly bridge. With Furuno Navigation / weather / radar, Satellite phone, and seven TVs this yacht is fully loaded with electronics. For more information on this lovely used 80′ Sunseeker yacht for sale in Florida be sure to contact Stephen Faraldo today!